Hope Everybody is doing good. 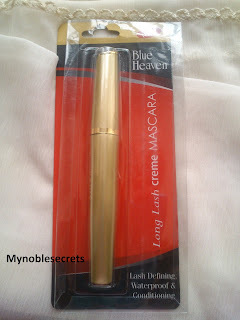 Today I am going to Review Blue Heaven Long Lash Cream Mascara. When I was surfing for goodies in online I have found this Mascara looking attractive. I have Lakme Mascara already, still wanted to give a try in this Blue Heaven Brand. I have included this Mascara on my Cart. Blue Heaven Long Lash Cream Mascara Lash Defining, Waterproof, & conditioning. 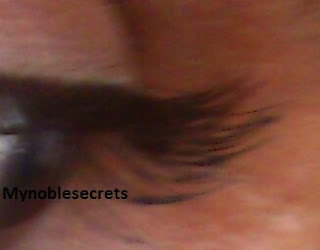 Creamy, waterproof, Flake proof,Clamp Proof Formula, Gives Your Eye Lashes, Length, Body & Fullness. 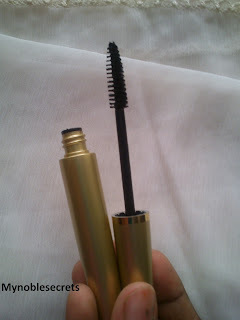 Will the tapered spiral brush the lashes can be easily separated. Stearic acid, Magnesium Aluminium Silicate, Acrylates/Octycrylamide, Copolymer, Alluminium Starch Octenyl Succinate, Propylene Glycol, Vitamin-E, Approved Coloures. I didn't find any creamy texture as it looks kind of dry mascara which I don't like. But for the price this mascara is ok. I am in love with this golden pack than the mascara...hehehe... This is not much water proof mascara as it they claims. 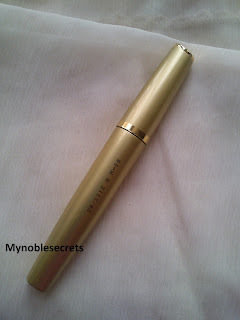 I have used lakme mascara before and loved it a lot. 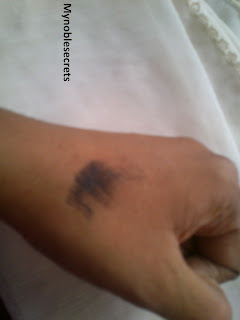 My eye liner and mascara journey started with Lakme only. Lakme was an affordable makeup brand in India for all desi girls, now a days Lakme increasing their product's price slowly. So, those who thought it is an affordable brand have to open up their mouth by hearing their current price list and have to leave the affordable brand idea. So, I have to search for some other affordable makeup brands. I was in search through online shopping sites. I found this blue heaven makeup brand is seems pretty affordable with all varieties. So, I bought this mascara from this brand to give a try. I would say this is not bad, good for daily use. Full ingredient list is not there. My Final verdict Blue Heaven Long Lash Cream Mascara is good product, can be used for local outings and not a perfect one who wants a perfect mascara. I have Maybelline mascara but that also became dry after some months.